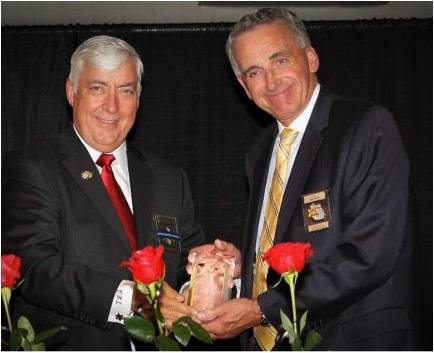 Tag Archive | "Terrence L. Jungel Sheriff of the Year award"
Kent County Sheriff Lawrence A. Stelma (right) has been chosen as the first ever recipient of the Terrence L. Jungel Sheriff of the Year Award by the Michigan Sheriff’s Association. Terrence Jungel is on the left. Larry Stelma, a long time Cedar Springs resident and Sheriff in Kent County for 16 years, has been selected as the first ever recipient of the Terrence L. Jungel Sheriff of the Year award by the Michigan Sheriff’s Association. The Terrence L. Jungel Sheriff of the Year Award is in recognition of Terry Jungel’s dedicated 20 years of service to MSA and recognizes a Sheriff who has made outstanding contributions to law enforcement and the criminal justice profession, demonstrates exceptional service to their community, and has contributed to the betterment of the Michigan Sheriffs’ Association (MSA). “There is no Sheriff in the State of Michigan that is more deserving of this Award and the recognition that comes with it than Larry Stelma,” said St. Clair County Sheriff Tim Donnellon, who is the MSA Board President. Stelma began his career at the Kent County Sheriff’s Office on January 3, 1972, as a deputy working various duties in the jail and eventually transferring to the road patrol. As a detective in the investigative bureau, he was awarded the Sheriff’s Office Combat Star for his efforts to save his partner when a domestic violence suspect shot that officer in the chest in 1980. In August 1981, Stelma was promoted to sergeant on the road patrol; in 1985, he was promoted to road patrol lieutenant; and promoted to road patrol captain in January 1997. In January 1999, Stelma was appointed to serve as Kent County’s Undersheriff. On January 1, 2001, he was elected by the citizens of Kent County to serve as their Sheriff. He has since been re-elected Kent County Sheriff for five consecutive terms. The MSA said that under Sheriff Stelma’s leadership, the Kent County Sheriff’s Office has become one of the most innovative, strategic departments in the United States. “Sheriff Stelma has woven the Office of Sheriff into the fabric of the entire community. He does this through his investment in staff; he is always there to be the friend to lean on, the guiding voice in a time of need, the stern guidance in a time of uncertainty, or jovial congratulation in a moment of triumph. Two particular initiatives that have affected Cedar Springs include the city and Sheriff Department partnership on police services, and the school resource officer at Cedar Springs Public Schools. Stelma was integral in the creation of the partnership between the City and the Sheriff Department in 2015, the first time anything like that had been done in Kent County. The Cedar Springs Police Department was dissolved, and the full-time officers were offered jobs at the Kent County Sheriff Department, and a chance to serve in Cedar Springs. Sgt. Jason Kelley oversees the Cedar Springs Unit, which currently works out of the former police area at City Hall. Cedar Springs was not the first public school to employ a Kent County Sheriff Deputy as a school resource officer, but the Sheriff Department did partner with the district to help fund the program. SROs work to improve school safety by investigating school related incidents and take a proactive approach to improve security of the campus, staff and students.